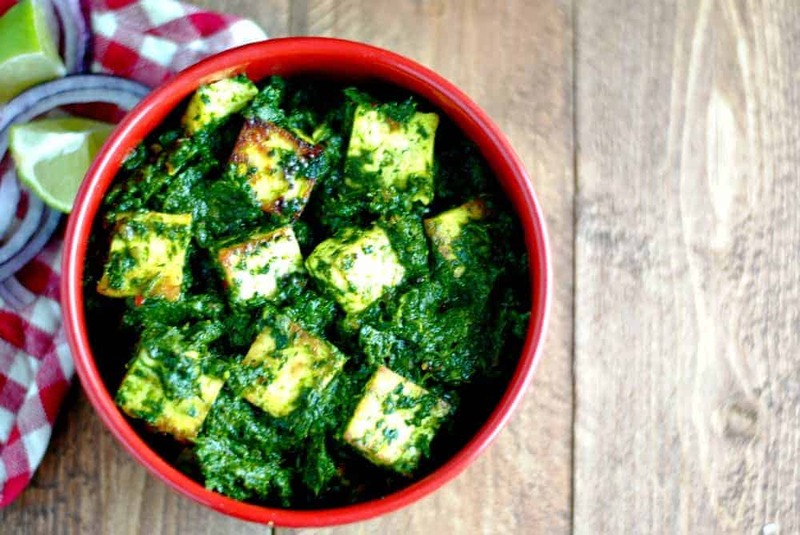 A tried and tested palak paneer recipe! Scoop up palak paneer with piping hot naan to get a taste of a much-loved North Indian dish. I so loooove Palak Paneer! If you like Indian food and haven’t sampled this very popular North Indian dish, you’re in for a treat. And if you are already a fan, try my version. 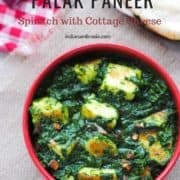 This is a palak paneer recipe that has evolved over the years as I kept adding and subtracting ingredients to arrive at that perfect taste and texture. And I have to say I’m quite happy with the present avatar. Not bland but not overpowering … just the right amount of zing! 1. Ginger-garlic paste and garam masala powder, those staples of Indian cooking. You can buy individual tubes or small jars of ginger-garlic paste at any Indian store or even big chain supermarkets like Walmart, but it’s ridiculously easy to make at home too. Just put equal quantities of fresh, peeled ginger and garlic along with a few tablespoons water in a small blender and whizz to a paste. Likewise with garam masala which is a blend of aromatic spices. You can buy it, but I personally don’t like using pre-made garam masala powder. It goes stale after a while. So, I make my own small batch: 5 black cardamom and 5 green cardamom, peeled, 8-10 cloves, and half a teaspoon peppercorns. Grind these in a spice grinder and you’re done. 2. Powdered spices like coriander, turmeric and red chilli (sub with red chilli flakes if you wish to) + cumin seeds. 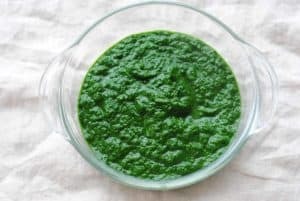 I used to add cream to the cooked spinach puree and you can certainly do that. However, it does make the dish quite heavy since we’re shallow frying the paneer too. In my opinion, it’s just a bit much. And honestly, it tastes great even without it. So skip the cream if you want a ‘light’ version of the dish. If you ask me, this is an optional step. 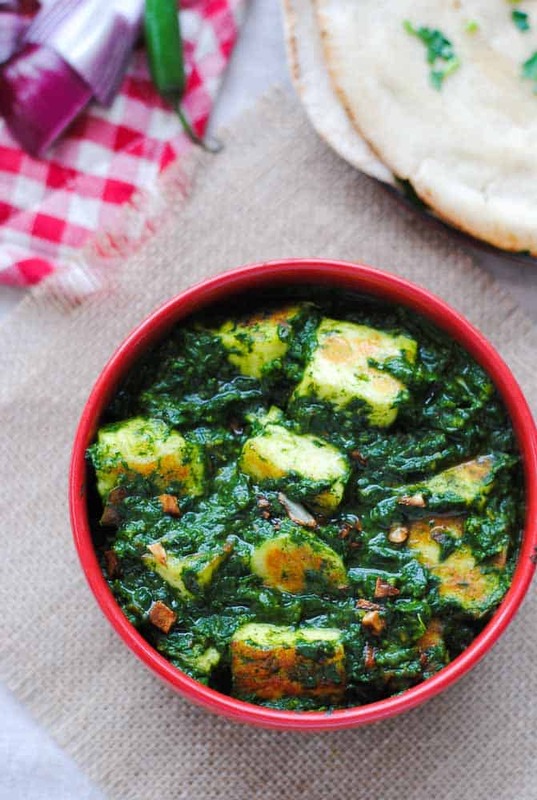 The cooked spinach is so flavourful that the paneer absorbs all the goodness from the curry and doesn’t need to be fried. In this recipe, I have fried it, but there have been loads of times I haven’t! Your call. If you decide not to fry the paneer, just cut the paneer block into square pieces (or any shape you like) and it’s ready to be put into the spinach curry. However, if you decide to fry it, heat a tablespoon or two of cooking oil in a pan and add the paneer pieces in it. Fry until golden brown, flip and repeat. Keep aside. 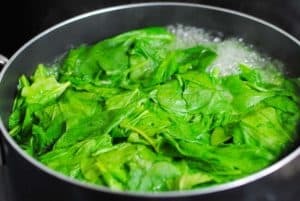 Wash the spinach leaves and remove the stalks (the stalks do not taste nice). Put the leaves in hot, boiling water. After a minute, remove with a big slotted spoon or tongs and dunk them in a large bowl of ice-cold water. Let stand in the cold water for about a minute again and put them straight in a blender. This stops the cooking process and preserves the bright green colour of the leaves. I don’t know about you, but I positively hate the over-cooked, watery and pale green palak paneer served at restaurants sometimes. Pulse, don’t puree. If you over-do it, you will get a fine paste (not desirable). The spinach should have some texture left. Heat the oil, tip in the ginger-garlic, chopped tomato, garam masala, powdered spices (coriander, turmeric, red chilli) and saute for a few minutes. Put the spinach in the cooking masala and simmer for a few minutes or until most of the liquid has evaporated. Finally, add the paneer cubes, cook for two minutes more and you’re done. Again, an optional step. I like doing it, so I’m including it here. Heat 2 tablespoons of oil in a small frypan and add 1 clove chopped garlic. When it starts browning, tip the contents (oil + garlic) on top of the dish. This adds a wonderful garlicky aroma to the palak paneer! Wash the spinach, cut off the stalks and put it in a saucepan of hot, boiling water. After one minute, remove with a slotted spoon and plunge in a large bowl of ice-cold water immediately. Let it stand in the cold water for two minutes. 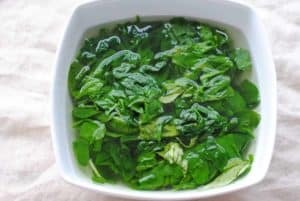 Remove the spinach from the water and pulse in a blender. Heat 3 tbsp oil in a pan and add the cumin seeds. When they change colour, tip in the ginger-garlic paste, tomato, coriander, red chilli and turmeric powders, garam masala and salt. Add a splash of water and saute for 5 minutes on medium heat. Add more water if required. 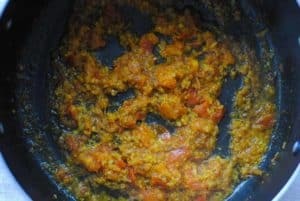 The tomatoes should soften and the masala cooked through. Add the spinach, mix everything and again cook for 5-6 minutes on low heat or until the water in the spinach has evaporated. Add the paneer cubes and cook again for 2 minutes. Take out the spinach paneer in a dish. Heat the ghee in a small frypan add garlic. When the garlic turns golden-brown, pour the ghee and garlic over the palak paneer. Serve hot with naan or rice. 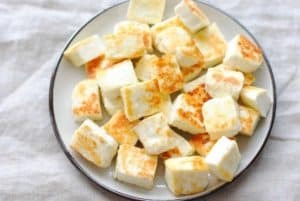 Fry the paneer cubes on a medium to high heat until they just turn golden-brown. If you fry them on low heat for a long time, the paneer will turn hard.